66. The carpenter's brace is used for turning such tools as wood auger bits, twist drills, screw-driver bits, countersinks, and reamers. Braces are made either with or without the ratchet device. A ratchet brace makes it possible to bore holes where the handle cannot be turned a complete revolution. This type is also more convenient in boring in hardwood and in driving screws with a screw-driver bit. For such work it is frequently easier and better to advance the brace by part turns rather than to make full continuous revolutions. The size of a brace is designated by its sweep or the diameter of the circle through which the handle swings. A brace with a 10-in. sweep is best for average work in the farm shop. 57. The auger bit is the most common tool for boring holes in wood. The size of an auger bit is designated by a number stamped on the shank, the number being the size of the bit in sixteenths of an inch. Thus a bit marked "7" bores a hole J4& in. in diameter, a bit marked "11" bores a hole »*•> etc. As an auger bit is tuined, the feed screw guides the bit and draws the cutting parts into the wood, so that only moderate pressure is required on the brace. The spurs or scoring nibs cut off the wood fibers, and the cutting lips cut out the waste inside the circle scored by the spurs, the waste being carried to the surface by the twists on the bit. To bore a clean, straight hole, the bit must be in good condition. 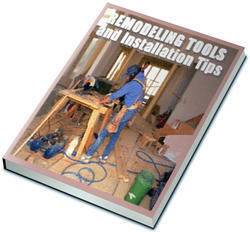 See page 98 on how to sharpen an auger bit. 58. Starting the Auger Bit.—Before starting to bore a hole, its center should be accurately located, generally by the intersection of two cross lines, or a small hole made with an awl. With the thumb and fingers of one hand, the bit is guided so that the point of the feed screw is placed very carefully at the intersection of the cross Jine3, or in the awl hole, while a slight pressure is exerted on the head of the brace with the other hand. Fig. 60.—The bit may be accurately placed by steadying the hand, knuckles down, against the board. Fio. 61-—To insure boring straight, sight from two directions, as at A; or check with a square, as at B. As the auger is started, care should he taken to keep it perpendicular to the surface (unless it is desired to bore a hole at an angle). 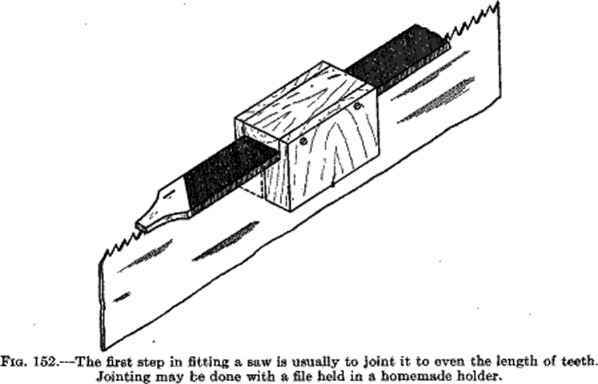 To insure that the hole is being bored square with the surface, step back a little, steadying the brace with one hand, and sight; then in a similar manner, step around and sight in another direction at about right angles to the first direction of sighting. If at any time it is found that the bit is not perpendicular, the top of the brace should be leaned accordingly. The try square may also be used to see if the bit is going straight. The student should not depend altogether on the square, however, but should develop his ability in sighting. Fig. 62.—To prevent splintering when borin« a hole, stop when the point of tho bit can bo felt and finish by boring back throuirh from the other aide. back side. The board is then turned over and the hole finished by boring from the other side. This prevents splintering of the wood around the edge of the hole. Another method that may be used, especially on pieces that can be held in a vise, is to clamp a block of scrap wood l>ehind the piece through which the hole is to be bored. The boring may then be done all from one side without danger of splintering. 60. Boring to Depth.—If it is desired to bore a hole to a definite depth, the turning is stopped as soon as the cutting lips touch the wood and the distance from the end of the chuck to the surface of the piece is measured with a rule. The boring then proceeds until the measurement on the rule is decreased by an amount equal to the desired depth of hole. If a number of holes are to be bored to the same depth, considerable time can be saved by cutting a block to the correct length and using it as a gage, as shown in Fig. 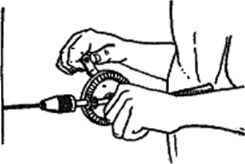 63C, or by using a homemade gage similar to the one shown in Fig. 67. 61. Counterboring.—Counterboring is making a hole larger in diameter at its mouth than deeper down. Where pieces of wood are fastened together with bolts, counterboring is frequently done to sink the bolt heads or nuts below the surface. 62. Prevention of Splitting while Boring.—Boring large holes in narrow pieces of hardwood sometimes tends to split the pieces, owing to the wedging action of the feed screw. Such splitting can be avoided by clamping the piece flatwise in a vise (with the jaws of the vise against the edges of the piece) while boring. ABC Fio. 63.—In order to bore to exact, depth, measure the distance from the surface to the chuck Juftt a« the lip» start cutting, as at A \ then bore until the measurement is decreased an amount ©qua! to the desired depth, as at B. When several holes are to be bored the same depth, a block may be cut to St under the chuck and used as a gage,' as at C.
other metal that would dull an auger bit. The smaller sizes of twist drills are very good for drilling holes to receive wood screws. 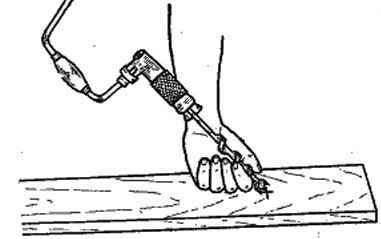 In drilling holes in wood with a twist drill or other blunt-pointed drill, the drill point should be started in a mark or depression made with an awl or nail-Otherwise the point may "drift'' from the proper location when the drill starts turning, and the hole will not be drilled exactly where it is wanted. When making holes in wood with a twist drill, the drill should be withdrawn frequently to clean the cuttings from the twist« or flutes. This prevents heating the drill and also speeds up the work of drilling. See pages 104 to 109 for suggestions on sharpening twist drills. Fig. 65.—The hand drill ia a very uecful tool for drilling small holes, either in wood or met3l. Fig. 64.—Wood-drilling hits. A, bit-etook twist drill; B. straight round-shank twist drill; C\ wood-boring drill; D, wood-<irill point. twist drills but arc usually longer and have sharper points. steel and have straight instead of spiral grooves or flutes. They are commonly sold in sets ranging in size from Ke to in. They are used in hand drills or automatic push-type drills. 66. The hand drill is one of the most useful tools for drilling small holes either in wood or in metal. It is small and light and is much faster and more convenient than the carpenter's brace. Also, there is less danger of breaking small drill bits when using them in the hand drill. 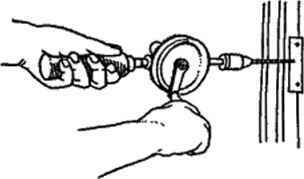 The hand drill should be held straight and steady, and an even pressure exerted. It is important also to turn the crank with a steady, moderate speed. 67. The automatic push drill is sometimes used for drilling small holes in wood. By pushing the handle down and letting it come back up, a forward-and-baekward rotary motion is imparted to the drill point. Drilling with the push drill is a little slower than with the hand drill. 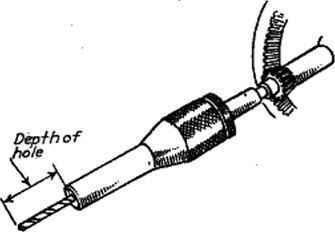 The push drill can be operated with only one hand, however, leaving the other free to hold the work. 56. (a) What tools besides wood auger bits are commonly used in the carpenters brace? (6) Of what, particular advantage is the ratchet brace? (c) How is the sue of a brace designated? (d) What size is best for the farm shop? 67. (a) How is the size of an auger bit designated? (b) Name the parts of the auger bit and give the purpose of each. 68. (a) Explain and be able to demonstrate how to start an auger bit at exactly the point desired. (&) How may the workman check his work to make sure a hole is being bored straight or square with the surface? 69. Explain two methods of boring a hole entirely through a board without danger of splintering. 60. Explain two or three methods of boring holes to a definite depth. 61. (a) What is counterboring? (b) Just how would you proceed to make a eounterbored hole? Fig. 68.—The automatic push drill. 62. How may large holes be bored in narrow boards without danger of splitting them? 63. Give two or three suggestions on how to drill holes in wood with twist drills. 64. 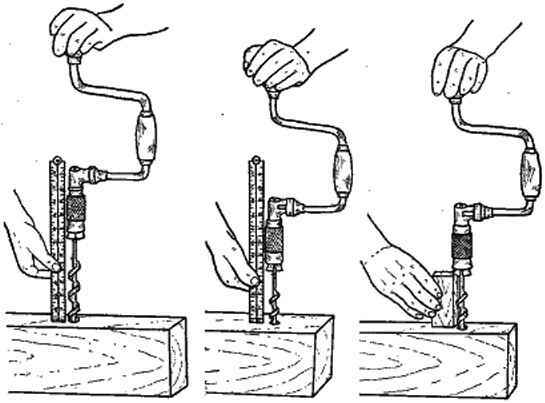 What is the difference between wood-boring drills and twist drills? 65. In what ways are wood-drill points different from twist drills? 66. 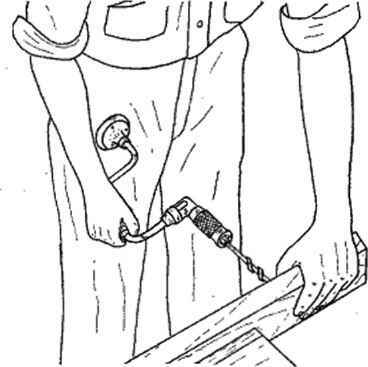 (a) Why is the hand drill better than the carpenter's brace for drilling small holes in wood? 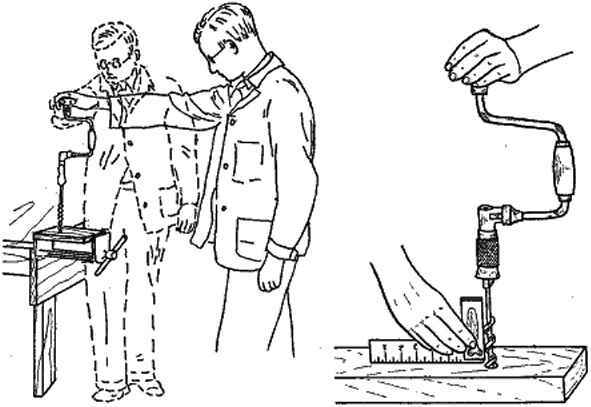 (&) What points should be observed iii using the hand drill? 67. (a) What is an automatic push drill? (6) What are its advantages and disadvantages when compared with a hand drill? Brown and Tustison: "Instructional Unite in Hand Woodwork." Griffith: "Essentials of Woodworking." Educational charts and pamphlets, Stanley Tool Works, New Britain, Conn.
Can boring tools be used on the farm?